Fresh in the farmstand this week we have a great selection of homemade baked goods including maple oat bread, roasted garlic focaccia, granola, Pietree crackers, and of course, pies! Our own pies! Thanks to our new oven and our amazing bakers all our pies will be proudly made right here at Pietree! This is something we have always dreamed of doing and we are so happy that dream has come true. 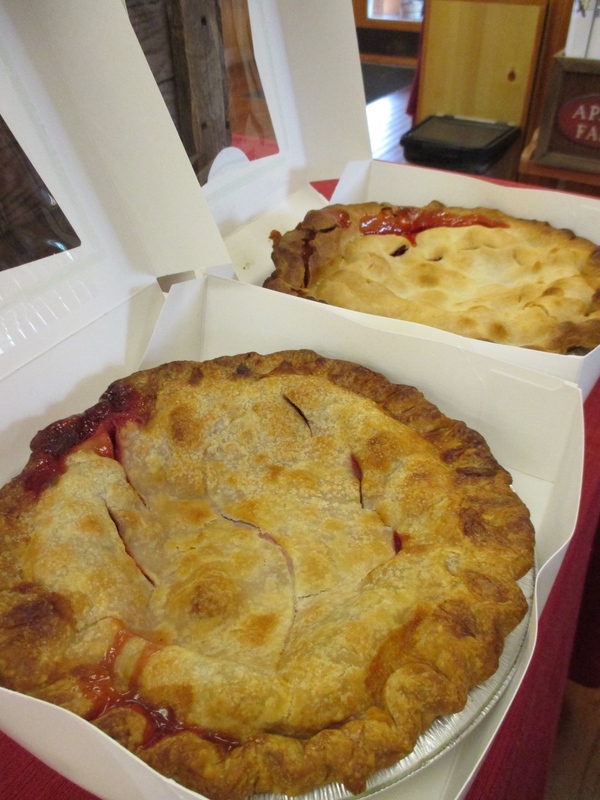 This weeks featured pie is a peach-vanilla made with our very own peaches from last season! Other flavors you may find include blueberry, apple, and strawberry-rhubarb. Above the Dam Peanut Butter, Maple Oat Bread, and Pietree Jams! Yum! New to the farmstand is Above The Dam Peanut Butter! Available selections include creamy, extra chunky and cinnamon & honey peanut butter! Above the Dam, LLC, is a family owned business in Dayton, Maine. All their peanut butters are hand-stirred in small-batches and include Virginia peanuts, Maine honey, and Maine sea salt. Unique flavors are made with single additional ingredients like cinnamon and dark chocolate. Fresh from the field this week we have a great selection of produce. Kale, chard, mustard, spinach, and Pietree Zesty Blend are all readily available at both the farmstand at the farmers' market this week. The first harvest of radishes just came in! We have both White Icicle and French Breakfast varieties available. The French Breakfast has a crisp bite with a moderate to gentle sweet taste, while the White Icicle has more of a hot, peppery taste. Both make wonderful additions to a Spring salad. Don't forget the Fiore Strawberry Balsamic Vinaigrette! It is almost strawberry season...all most. The long, hard winter followed my the cool, wet spring has caused the strawberries to be a little late this year. We expect to have a SMALL amount available in our farmstand in about two weeks. Pick-your-own will open once the fields are full and the berries are ripe. We are hoping to have more information for you soon! Please call ahead if you are coming specifically for strawberries or FMI- (207)647-9419. A Glimspe Of What Is To Come! We Expect To Be Harvesting Strawberries By Late June!